We are all part of the movement to rebuild ecosystems across North Texas. There is a lot of jargon out there surrounding conservation. “Conservation landscaping” is a term that’s being thrown around a lot these days, but what exactly does it mean? Basically, it means that each of us who gardens at a home, or those managing commercial properties, is responsible for improving our environment by using responsible practices in our landscape. We are all part of the movement to rebuild ecosystems across North Texas. All gardeners have the potential to damage ecosystems on their own property by using excess chemical fertilizers and pesticides or planting poorly adapted plants in the landscape. Bees are a necessary part of a conservation landscape. Conservation landscaping begins with understanding your soil and why it’s important. Soil must be protected from erosion, harsh chemicals and mistreatment. By keeping soil fed with compost and other amendments, you are growing a host of microorganisms that improve soil structure and quality. When soil is bioactive and healthy, plant roots are better able to use the available nutrients. Healthy soil also holds a better balance of moisture, meaning you’ll have to water less. Choosing the right plants for the surrounding environment makes for a healthier landscape and better use of resources. For example, when you plant turf grass in shady conditions here in Dallas, you’re going to waste a lot of water, fertilizer and energy. Warm season lawns just don’t grow well in shade and no amount of water or fertilizer will change that. A better choice would be to plant a shade-tolerant ground cover in these areas instead of a lawn. Have a hot sunny spot with little available irrigation? Don’t plant water hungry plants! Choose water-wise plants, such as agave, sedum or ornamental grasses that can take intense heat. Plants that could be included in a conservation landscape include native and adapted trees, shrubs and perennials. While native plants might not always be the right choice for your location, there are many non-native plants “adapted” to our climate that make good choices. When you’re shopping for plants, be sure to ask for plants that are adapted to our climate. Don’t forget the wildlife: Part of successful conservation landscaping is providing plants that offer food value to birds and pollinators. In this case, natives are often the best choice, as you want to provide food plants that the native wildlife population is accustomed to. 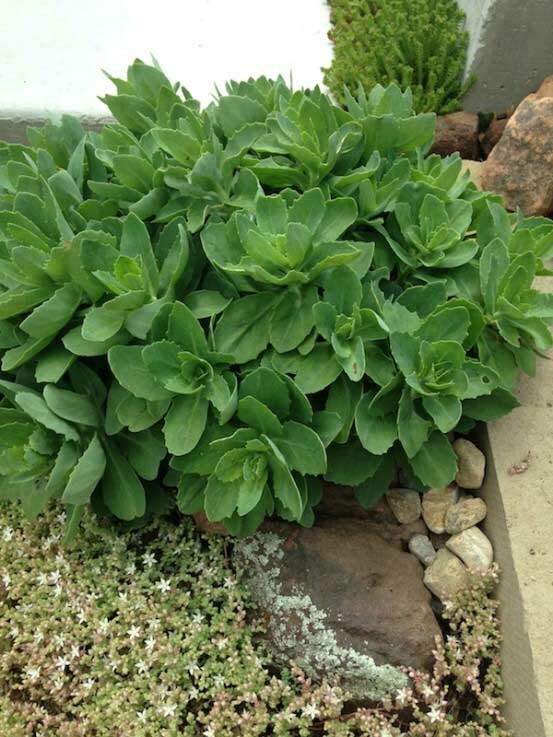 Sedum comes in a variety of shapes and textures and use very little water once established. Save water in your conservation landscape! Irrigation is another key factor in a conservation landscape. If you have an automatic irrigation system, when was the last time it was audited or repaired? Do you understand how to properly set it each season? Does it have a working rain or freeze sensor? Keeping your irrigation system up-to-date and working properly will save you money and water. Again, using the right plants in the right place will go a long way to helping you conserve water. Call us if you need a recommendation for an irrigation expert. We highly suggest having a certified irrigation specialist check your system once a year. Because we know you care about your family’s health, we are committed to helping you reduce your chemical footprint by helping you grow a “barefoot approved” lawn and landscape. We use time-tested organic methods to feed your soil, trees, shrubs, perennials and lawns. Our compost tea extract is homemade using locally recycled materials. Want to know more about our Soil Building Program? Give us a call at 972.272.9211 or contact us online.